This is an information page about my latest opera, an adaptation of Sarah Kane’s 4.48 Psychosis. It is the first ever permitted adaptation of any of her work. For more information about the production, please contact me directly. Royal Opera House production weblink here. 4.48 Psychosis was the astonishing final work of the radical British playwright Sarah Kane, first performed posthumously in 2000. Detailing the experience of clinical depression, the play harrowingly reveals, through poetry, anger and dark humour, an individual’s struggle to come to terms with their own psychosis, the numbers in the title referring to the time in the early morning when clarity and bleak despair strike together. 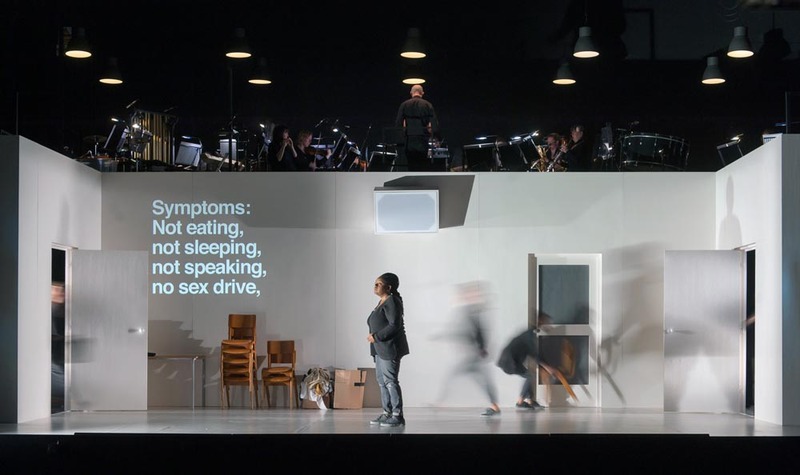 In Philip Venables’ new operatic adaptation of Kane’s play, directed by Ted Huffman, the search for love and happiness and the struggle for identity are explored through a fusion of opera with spoken and visual text. Presented at the Lyric Hammersmith, this is a production that promises to bring a new resonance to the last creative utterances of one of the most courageous young British writers of her generation. For more extensive press coverage, click here. Duration: 90 minutes, no interval, in 24 short scenes. Ensemble, 12 players: alto flute + picc, 3 saxes (all sop+bar), piano+synth with organ pedalboard, accordion, 2 percussion (solo roles, some playing from memory), vln+vla, 2 vla, bass. Percussion: two bass drums, two high-strikers, woodsaw & wood, other standard orchestral percussion. Sound dispersion: All singers and ensemble amplified. 1 stage speaker (central), stereo sound in auditorium, click tracks to ensemble. A significant amount of pre-recorded material must be recorded with the cast.